This straw hat has a front brim that is tipped back in the center, which may be trimmed with ruched velvet to coordinate with the dress. 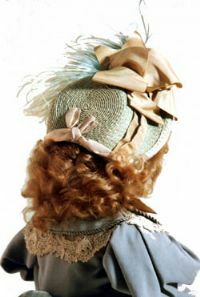 The crown is flat in the back, and may be trimmed with pleated ribbon placed along the bottom edge, ending with a tied knot in the center back. A wide pleated ribbon may be placed around the crown with several ribbon loops and feathers. C 022 - child doll with a head circumference of approximately 11 inches. Requires 15 yards of braid, sold separately or as part of a Kit. C 022-A child doll with a head circumference of approximately 9 - 9 ½ inches. Requires 12 yards of braid, sold separately or as part of a Kit. C 022-B child doll with a head circumference of approximately 8 inches. Requires 10 yards of braid, sold separately or as part of a Kit. This size fits Rosette, Bleuette's older sister, or any doll with a head of 8 inch circumference. C 022-C child doll with a head circumference of approximately 6.25-7.25 inches. Requires 10 yards of braid, sold separately or as part of a Kit. It also fits Bleuette.